Create a presence, have a strong base, give the passer confidence, always call for the ball (or you won't get it), and go after it. Show both hands to the ball (don't get a cheap foul pushing off), catch with two hands (backstop with one hand), then chin it. Catch with long arms (extend your arms) or the defender can deflect it. Footwork is the most important part, your feet create angles to score, and separation. Post up on the balls of your feet, attack the defender's top foot, you move every time he moves it. Try to drive him up the floor (the lane line) with your hip (show your hands), make him decide whether to stay high or go behind. On a pass to the corner of the backboard it's a quick hip swivel (hip check), release and go get the ball. If the ball gets reversed to the top of the key, try to leg whip him (reverse-pivot seal), if the ball then goes to the other wing, drive him to the foul line (seal him out), keep attacking the top foot (drive and whip). See Post play - Danny Manning warm-up. a) Straight flash (shown) - rip (under his arm) and step over, carve through his body, attack his top foot. 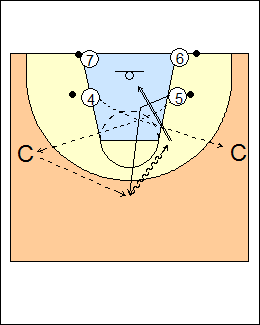 b) Duck move - step toward the basket like you are going for a lob, then straight flash footwork (step down then across). c) Spin move - walk into his chest, step between his legs with your top foot, spin (reverse pivot) as soon as he backs up. Make the same move on both sides, rebound and change sides. Never post up below the block, catch with your shoulders square to the passer. a) Left-shoulder jump hook - always catch on the move, 5 steps down the lane on the pass, no-dribble jump hook (4 goes middle). 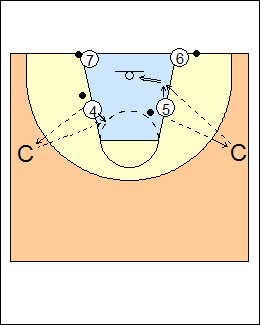 b) Left-shoulder chop move (up-and-under counter) - 5 shot fakes (show the ball to a defender), if he bites, chop it across his face, step through (middle), go to a one-dribble counter move. c) Right-shoulder turnaround jump shot. d) Turn rip move (counter) - turn right shoulder, rip it across, one bounce to a jump hook. The defender has pushed you off the block. 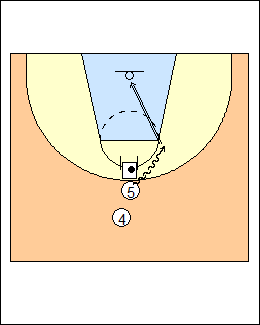 a) Left-foot rip - 5 reverse pivots on his left foot, attack the basket with one dribble (sweep baseline). It's an automatic rip if you check middle and see your defender's face/numbers. On the other side, 4's dribble has to be low and quick, he's blind to what's going on behind him. b) Left-foot jab-step step-over - 5 reverse pivots on his left foot, jabs baseline, steps across (middle), one-dribble jump shot. c) Angle crab dribble - if 5 is not quick, reverse pivot, jab baseline, two crab dribbles to the middle, jump hook or get to the basket. Players take a ball off a chair at the top of the key, take it under the chair into a one-dribble pull-up, go both ways. a) Slide-step pivot - get to the foul line, the footwork going right is R-L-R (or L-R-L going left), head up, drop the inside shoulder. b) Jab-step step-over - jab right, crossover R-L, you won't be able to get as far with only two steps (also jab left, crossover L-R). c) Touch and go - jab right, go (the defender doesn't bite), the footwork is R-L-R.
Progressions - shot-fake slide step, shot-fake jab step. Use a cheat step when flashing away from the basket, plant the outside foot, the foot closest to the basket is the pivot foot, push back and front pivot to square up. a) Pull-through, one bounce where you came from (crossover, Manning shows three steps, L-R-L for 5), stay on your side (4 fans opposite when 5 flashes). b) Cheat step, jump shot. 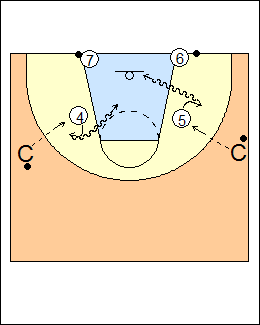 c) Cheat step, shot fake, one dribble where the pass came from (a slide-step pivot, three steps, L-R-L for 5). 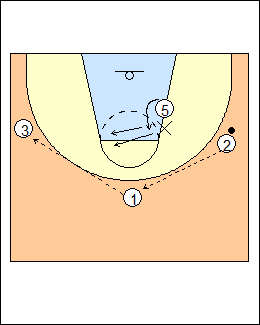 Option - everything is a make, pump-fake putback on any miss. See Post play - Danny Manning two shots, Shooting - Bill Self perimeter.